Red-shouldered Hawks (Buteo lineatus) live and nest in the suburban areas surrounding the city of Cincinnati, in southwestern Ohio. They make their nests in a variety of locations, including woodlots, yards, and in rare cases, even on rooftops of buildings. These beautiful raptors, with their black-and-white wings and tails and their brick-red bellies, were once considered a “species of special concern” in the state of Ohio due to their limited distribution within the state. In several other states in the eastern U.S., they still have similar status. Yet their abilities to adapt to new situations and to tolerate human disturbance, in combination with the amount of green space retained within the Cincinnati-region, have allowed them to thrive in our suburban habitats. 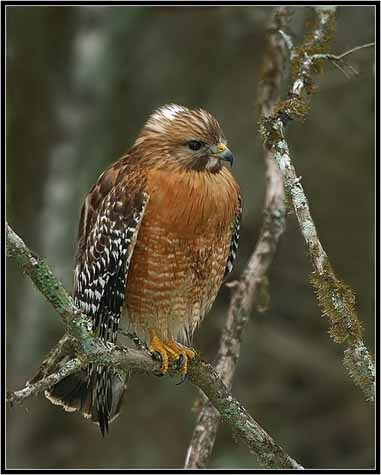 Our team of ornithologists and volunteers has spent the last 15 years researching aspects of the Red-shouldered Hawks’ ecology that have enabled them to persist and succeed here. We have studied their nests, reproductive rates, home range, diet, survival, and abundance in some detail. In doing so, we have gained more appreciation for this remarkable species. We have created this website to share some of the interesting information we have learned. We hope you enjoy it.